Haiti, a third-world country which shares a mainland with the Dominican Republic, was ravaged by a magnitude 7.0 earthquake. On that fateful day in 2010, a worldwide movement focused on aiding the impoverished country was started. People from all over the world came together to help. This movement is what attracted Joe Genoways to go to Haiti and help 5 years after that tragic day. Genoways is 21 years old and is a senior biology major at Morningside College. He first went to Haiti on a mission trip with his church for a week. He instantly fell in love with the island and its inhabitants. The beautiful warm water and palm trees would make anyone question the fact that it is a third world country. This first trip to Haiti was in 2015 and was just a taste of what was to come in 2017 for Genoways. 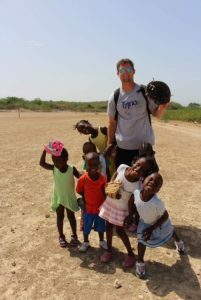 The following year he went back for the whole summer to help out as the activities director at an orphanage. Working at Tytoo Gardens orphanage for a whole summer, Genoways started to see why Haiti was such a rough place to live. Haiti is a country heavily affected by gang activity and clean water shortage. Although living in Haiti comes with several difficulties, Genoways goes on to say “Haiti is one of the most beautiful places I have ever been to, and the people I have met there were incredible. One day I hope I can adopt out of Haiti and bring them back to the states with me”. Spending a whole summer away from home can be hard on anyone, though luckily he had the help of his mother to get him through it. The apple doesn’t fall too far from the tree when it comes to Joe Genoways’s aspirations to someday be a doctor. Throughout the last 20 years his mother has worked in the medical field as a surgical nurse. Through his mother’s profession, he fell in love with the ideals of healthcare at an early age. During his stay in Haiti, his mother went to visit him for a week and also loved it. She said that “as a nurse, she has a moral obligation to help those in need, regardless of their nationality”. At 9:50 AM an explosion occurred at the Mega City Mall today. Police have assigned investigation units but still do not know what caused the explosion. Sargent Fulsang said “over a hundred people were injured and two were deceit in the explosion”. There is no indication that this was an attack of any kind and the condition of the mall is still unknown. The explosion happed in the food court and the mall will be closed for the rest of the day and possibly the week. We spoke to eye witness Elliott, who was ditching school at the time of the explosion, said “I was eating in the food court and saw the explosion and almost peed my pants, it was the scariest thing I have ever seen”. We still do not have much information about what caused the explosion but there is another press conference here this after noon. Haiti, a third-world country which shares a mainland with the Dominican Republic, was ravaged by a magnitude 7.0 earthquake. On that fateful day in 2010, a worldwide movement focused on aiding the impoverished country was started. People from all over the world came together to help. This movement is what attracted Joe Genoways to come to Haiti and help 5 years after that tragic day. Genoways is 21 years old and is a senior biology major at Morningside college. He first went to Haiti on a mission trip with his church for a week. He instantly fell in love with the island and its inhabitants. The beautiful warm water and palm trees would make anyone question the fact that it is a third world country. This first trip was just a taste of what was to come in 2017 for Genoways. The following year he went back for the whole summer to help out as the activities director at an orphanage. Spending a whole summer away from home can be hard on anyone, though luckily he had the help of his mother to get him through it. The apple doesn’t fall to far from the tree when it comes to Joe Genoways’s aspirations to someday be a doctor. Throughout the last 20 years his mother has worked in the medical field as a surgical nurse. Through his mother’s profession, he fell in love with the ideals of healthcare at an early age. During his stay in Haiti, his mother went to visit him for a week and also loved it. She said that “as a nurse she has a moral obligation to help those in need, regardless of their nationality”. Mason Knaub is a mass communication major and business minor from Omaha Nebraska. Knaub found his way to Morningside in pursuit of his love for music. He is currently on the Morningside drum line. Knaub has many hobbies such as lifting, playing music, production, and MMA. He listens to all kinds of music, except for country, but his favorite kind of music is rap and hip-hop. He would love to get a job in audio production after he graduates and he would like to live in Omaha. Mason Knaub ends our interview by saying “If I was stuck on an island with one person for the rest of my life I would pick Joe Rogan”. This was this weeks news here on the M News. This news story is newsworthy and caught my attention, however there are a few things I would change. The title of the news article used trigger words to get my interest. It was short and to the point. On this article one issue I found was that I could not find the reporters name anywhere on the page! Another thing I would personally have changed to this news article is that I would’ve added in links to articles linking to what happened back in 2015! This was your news updates with the M News.